September 4, 2018  Johnny Bobbitt says he has only received $75,000 of the GoFundMe money raised to get him off the streets. The rest, he argues, has been mismanaged and spent by the couple who pledged to help him. 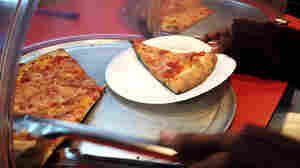 January 14, 2015  A Philadelphia pizza shop has become an ad hoc feeding program for the homeless where customers can pay the $1 slices forward. To date, some 8,400 slices have been bought for the homeless.